Letting fees are set to disappear. The Government has announced its intention to introduce a total ban on all lettings fees. Letting agencies across the UK will not be able to charge any fees to tenants for their services, if the Government’s proposals are implemented. 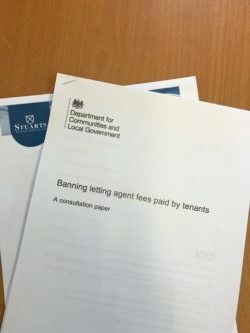 Today’s publication of the Consultation Paper leaves us in no doubt that there will be a total ban on lettings fees, it is just a matter of when and how it is implemented. Small, independent companies such as Stuarts Property Services are rarely consulted and we feel we offer value for money in our services to tenants. Our recent reviews show that we offer good service at good value . Indeed , we undertake in-house surveys (see below) to ensure that we are being competitive. Lettings is our bread and butter too – we want to let properties for our landlords and accomplish a professional service to the landlords ensuring that all reference processes are vigorously followed to minimise any risks for landlords. However it seems that the Government now wish us to do this for free for tenants, so how will it impact us as an agency and you as a landlord? According to This is Money.co.uk, There are 19,000 estate agent branches in the UK, with 18,000 sales and lettings agents on Rightmove and 16,460 on Zoopla. A handful of 50 hardly seems to get an industry overview does it? You only have to do a little research on the large property portals to see which agencies are conforming to the ‘displaying fees’ regulations and those that are not and in my opinion, the differing fees seem to highlight what a huge North/South divide that our country has. We at Stuarts believe in rules and regulations and our reviews on our website show that we do take them seriously, but being such a small entity compared to the huge franchises and national companies with power far beyond ours, it is disconcerting that such rules and regulations just are not being followed by all and the unscrupulous agencies are causing such distaste in the industry as a whole. David Cox, Chief Executive, ARLA Propertymark, said, “The Government’s housing policy is shambolic and today’s consultation contradicts its already stated aim to encourage longer term tenancies. Independent analysis launched at ARLA Propertymark’s annual Conference last week revealed that if an outright ban was introduced, rents will increase by £103 per year which will only serve to financially punish long term tenants. Chris Norris, Head of Policy at the National Landlords Association (NLA), said, “We’re particularly concerned that the scope of this consultation appears to have drifted to include tenancy deposits, with suggestions that a ‘cap’ may now be necessary. This looks like yet another attempt to affix a sticking plaster to a perceived problem without really understanding what is driving behaviour in the real world”. Richard Price, Executive Director of UKALA, said, “Small agents are drowning in constant policy interventions. The publication of this consultation in isolation, at a time when we’re awaiting further proposals on requirements for all agents to hold client money protection insurance, is proof that this Government does not have a clear vision for the future of the sector. Rationale for introducing a ban – Whilst most letting and managing agents provide a reputable service, a minority of agents offer a poor service and engage in unacceptable practices. Some agents may be motivated to act in their own interests, which may be contrary to the interests of the tenant or landlord. Some letting agents exploit their role as an intermediary between the tenant and landlord by imposing unfair charges on the tenant or double charging tenants and landlords for the same service. Shelter’s 2013 report found that nearly one in four people in England and Wales feel that they’ve been charged unfair fees by a letting agent. Property Budget News Proper Tea Day – Come and Join Us!